Hey guys, I'm kind of new to the FM series, only have 20 hours so far but I'm loving it. Currently I'm just enjoying playing as a Romanian club thats mid-table/relegation. I know that my best players are my CBs, winger, st and my DLP who i tend to play as a regista which he is accomplished at. My question is, what tactic and formation would suite this kind of squad? Im trying to better understand how to process my teams strengths and to what styles would then suit that. 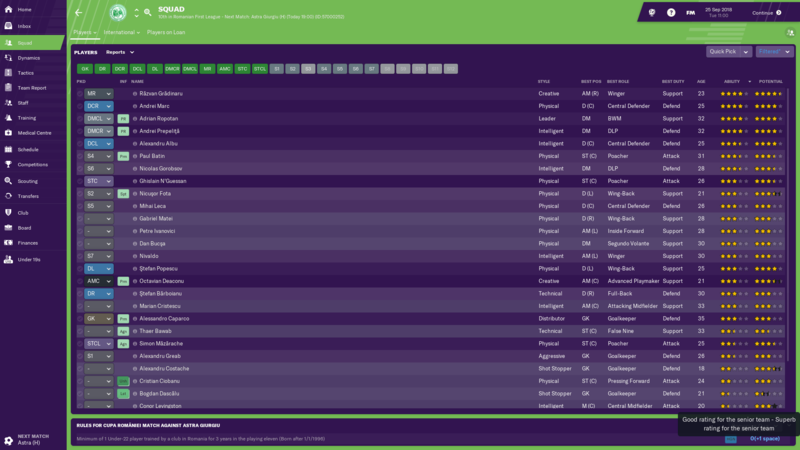 As you are still finding your way around what you could do is click on the "Team Report" menu option then "Squad Depth". This gives you a guide of where the game thinks you may be strong or weak for various formations which you can pick. You can also click on "Comparison" which may help give you an idea of how your players rank in terms of ability against other teams in your league. This may help start you thinking about which formation your team may be suitable for and whether you could play in an aggressive or more passive/counter attacking manner. Once you start to find your feet and become more accustomed to the game you may find you'll use these options less and less as your own experience kicks in, but it can still be a decent enough way to help get you started. Also if you fancy some reading, there are plenty of guides linked in the thread pinned to the top of the forum called "Please Read". Of course if you get really stuck and need some specific tactical advice, feel free to ask . Ask yourself what formation you want to use , 4 backs or 3 backs ? If you play 3 backs can your winger play as wingback since seems like you short on full back . If you play 4 backs how do you set up the midfield base on the team ? After you have a formation set and what would you like to see the team playing possession or counter attack or direct or others ? How to set up the roles and what those roles will do in possession and not in possession , let's say you want to play counter attack . There are lots of article here in forum you can check to understand this game . That's 6 of your 11 best players on the field at the same time, in positions they are at their best, in their best roles and only the Striker may need role/duty tweaks - there's your basis to build on. Being mid-table, the two DMs will help against the top-half teams and you can create a real solid, hard-to-break down defensive tactic, and also push up and be more Positive when playing lower teams without having to change too much at all as far as the individuals are concerned. So, have a look at the preset tactics and find one that 'suits' a 4231 that you like. This gives you a pretty solid set of Team Instructions to start with as your foundation. 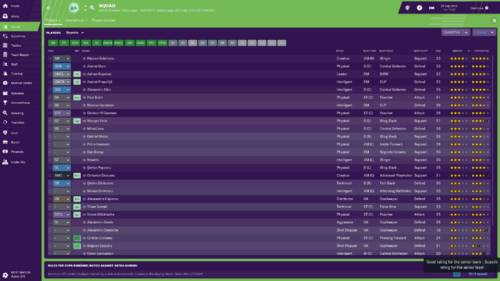 From this point, you are just about ready to start your first match - fill the empty positions with the best of/most suitable players in the squad and watch how they all perform. Is it how you expected? How you wanted? from here it's a case of gentle, and small tweaks to the tactic and observe the results. For team strengths and styles I would look at each players Traits and attributes (the Key Players) to guide you as to whether to play a quick, pacey counter attack, tiki-taka passing, physical or hard working gegenpress. You want to really try and build a team around these key players, and focus on unlocking their strengths. The 'Team Comparison' page under Team Reports is useful to gauge yourself against the rest of the league.